It wouldn’t be a proper Easter dinner in Naples without a pastiera napoletana for dessert, as essential to the Neapolitan Easter as struffoli are to Christmas. This wheatberry and ricotta pie is wonderfully perfumed with orange blossom water, cinnamon and candied fruits, a kind of ne plus ultra version of the everyday ricotta cheesecake. A proper pastiera also requires some patience. Customarily, you start making your pastiera on Good Friday, when you prepare the filling and let it rest overnight. On Saturday, you actually make and bake the pastiera and let it rest overnight, before digging into dessert on Easter Sunday. Of course, you can do it all in one day, but I would still try to make your pastiera the day before, or at least in the morning for consuming in the afternoon. The rest really does improve the flavor. Add the grano cotto to a saucepan, along with the other indicated ingredients, over low heat. Bring to a simmer and cook, stirring frequently, until the mixture turns creamy and porridge-like, usually about 5-10 minutes. Turn off the heat and let the mixture cool completely. Pour the ricotta into a large mixing bowl. Add the sugar and whisk vigorously until the sugar is well incorporated and the mixture is rather fluffy. Mix in the eggs as well, one by one. Now add the cooled grano cotto, folding it into the ricotta cream until well incorporated. Add the cinnamon, vanilla and a few drops of orange blossom water. Taste and adjust the seasoning. Add more orange blossom water if you want a more perfumed filling, taking note that its intensity will lessen in baking. If you have the time, let this mixture rest in the fridge overnight. If not, even a few hours will do it good. Mix the flour and sugar together by pulsing in a food processor. Then add the lard or butter and pulse until you have a sand like texture. Then add the egg yolks and mix again until the dough forms a ball, adding a bit of water, spoonful by spoonful, if need be. Cover the dough ball with plastic wrap and place in the fridge to chill for at least 30 minutes or until needed. Take the dough out of the fridge. Take about 2/3 of the dough and roll it out into a round. To do this, I like to form the dough into a ball, flour it to avoid sticking, then beat it out flat with a rolling pin first, turning it around, then over, to get a fairly even round disk. Then I begin to actually roll it out flat. The round should be big enough, of course, to line the inside of your pie plate. Pour the filling into the pie plate, taking care not to fill the pastry shell to the very top, since the filling will swell during baking. Roll out the remaining 1/3 of the dough, then cut into strips. Lay the strips over the filling in a diamond-shaped (not square) lattice pattern. Press the strips gently into the shell and cut off any excess dough. Let the pastiera cool completely. If you have the time, let it rest overnight. Serve, straight from the pie plate, dusted with confectioner’s sugar. As mentioned, one of the ingredients that make a pastiera a pastiera—and not simply an Italian cheesecake—is the grano cotto or pre-cooked wheat berry. 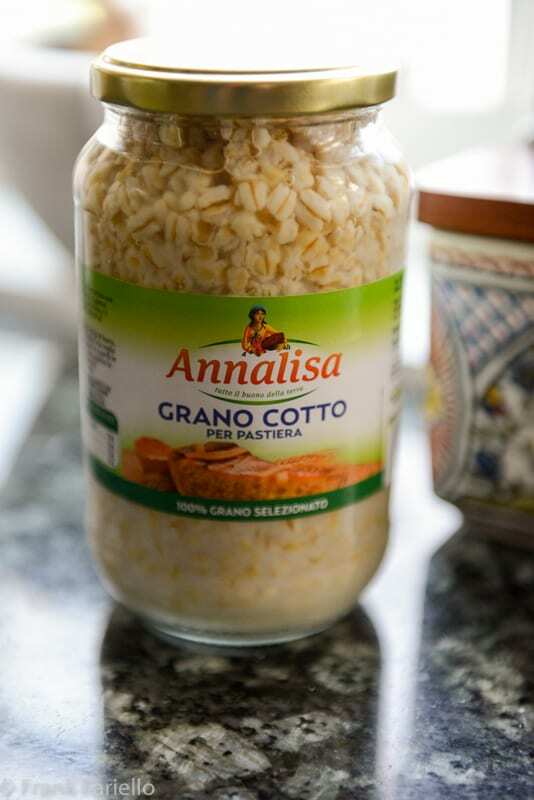 In Italy these days, grano cotto is sold commercially, in large jars as pictured below. You may be able to find it in finer Italian specialty shops. You can also buy it online. The quality is generally excellent and it saves a great deal of time. Many traditional recipes said you needed to soak wheat berries for three days before cooking them—which meant you needed to begin making your pastiera a full six days before you wanted to eat it. Francesconi even talks about old time Neapolitans soaking them for two weeks. But these days wheat berries don’t need all that soaking. An overnight soak will do fine, and some sources say you needn’t soak them at all. Boil them until tender, usually about an hour and a half, before using them as you would grano cotto in the above recipe. If you can’t find dried wheat berries, I’ve gotten perfectly acceptable results with pearled barley. And they say that farro also works well, although I haven’t tried it myself. The other “exotic” ingredient you will need for your pastiera is orange blossom water. I would venture that if you have a Middle Eastern or North African market in your area, they would carry it. Otherwise, it, too, can be purchased online. Some recipes call for substitutes such as grated orange peel or orange extract. Neither quite does the trick, if you ask me. Orange blossom water provides a heady perfume that has no real substitute. I agree with Francesconi when she says that you can’t make a proper pastiera without it, although you will nevertheless have a very tasty pie. I recommend you use it with discretion, as its strong aroma easily becomes overpowering. The candied orange and citron peel can also be hard to come by, although supermarkets will sometimes carry them around Christmas time, for making fruitcake. You can also find them online. Or make them yourself, if you have the patience. You can also simply leave them out if you like. There is a typical pie plate used in Naples for making pastiera. It is very much like your typical US pie plate, but it is lipless and slightly wider than the standard 9″ pie plate. If you’re using a US pie plate, you’re likely to wind up with a little extra filling following the measurements above, depending on how deep your pie plate is. But no worries, it’s the cook’s perogative to enjoy a bit of the raw filling when no one’s looking. It’s quite tasty in its own right! Typically, a pastiera is served “family style” directly from the pie plate. If you want a more elegant presentation, however, you can bake your pastiera in a springform baking pan and unmold it before serving. There are all sorts of subtle and not so subtle variations among recipes for pastiera. The basic ingredients and method remain the same, but the measurements can vary tremendously. Today’s recipe is my personal version, developed over time to suit my tastes. I’ve radically reduced the amount of sugar you’ll find in most recipes. Classic recipes call for as much as double the sugar called for here, in both the filing and the crust. I find that cloyingly sweet. But if you have a sweet tooth, you could up the sugar, perhaps by 50% to start with. I’ve also increased the amount of wheat berries—some recipes calls for only half this amount—and reduced the number of eggs. I’ve had trouble in the past with soft, almost liquid fillings too flimsy to hold up the lattice topping. These measurements eliminate that problem. And I rather like the rather chewy, slightly crumbly texture you get this way. If you want a less rustic texture, you can purée some or even all of the wheat berries. If you want a more solid filling, you can add another egg or two. Some recipes, including Francesconi’s, have you separate the eggs and whip the whites, which are folded into the filling mixture just before baking. Other recipes call for a combination of two whole eggs and two yolks rather than 3 whole eggs. Finally, one common variation has you add a goodly amount of crema pasticcera to the filling—not something Ive tried. The egg and fat content of the crust also varies quite a bit from recipe to recipe. I liked the result I got from the measurements given here. The high fat content gives it a nice flaky quality. In the blogging world, it’s pretty much customary—and for good reason—to post holiday recipes before the holiday in question. This way your readers can go out and make the dish for the coming holiday if they want to. Well, you’ll no doubt notice this recipe is coming out the week after Easter. All I can say is that for us non-professional bloggers, life (especially work life) sometimes gets in the way of blogging. And so it was this year, for this dish. But even so, it’s Easter season, isn’t it? And Orthodox Easter is happening this weekend. As Francesconi says, leftover pastiera is enjoyed for days and even weeks after the actually holiday, often with morning coffee, which is exactly what I’m doing as I write these lines. 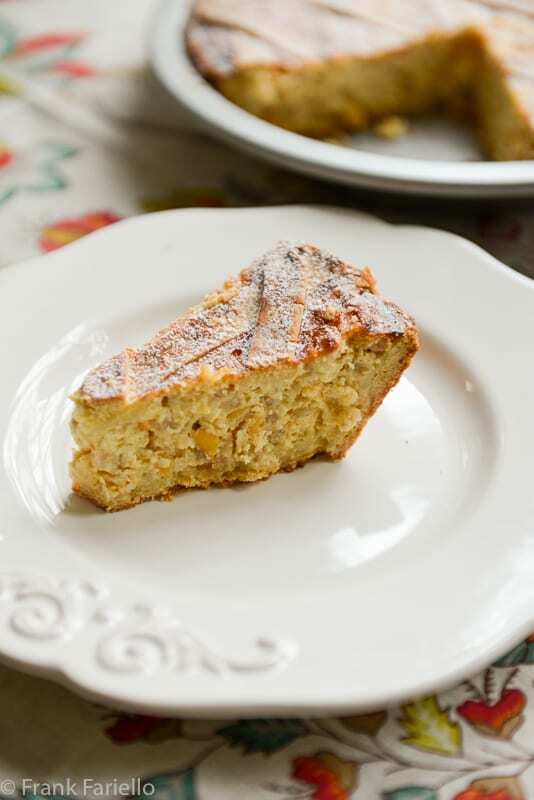 And with the arrival of commercially made grano cotto, she says that pastiera has become a year-round treat, even if it retains its close associations with the Easter season. So go ahead and enjoy this Neapolitan treat any time you feel like it. Let the pastiera cool completely. If you have the time, let it rest overnight. Serve, straight from the pie plate, dusted with confectioner's sugar. Thank you for this recipe. I have been making this pie since I was a little girl, with my Grandfather, but using three times your recipe because we made it for the whole family. Unfortunately as the years have gone by and the elders passed, and I am the only one who enjoys it anymore. I have tried to make a single, smaller version. Not a pretty picture. But now with your recipe, I’m going to give it another try. I am so excited and will let you know how it comes out. Buona Pasqua.. I know the feeling, Rose, of being the only one left who enjoys some of these old time dishes. But who knows? Sometimes they find a new life among the young folk, so let’s keep on making them! Thanks so much for stopping by. E Buona Pasqua anche a te! I am all about authentic holiday recipes from different countries! I find it fascinating to read about the recipes, and then I always enjoy the challenge to actually make the recipe in my kitchen. It helps keep things different! I must admit that the pastiera napoletana is a new one to me, but I’m game to try it out. It sounds delicious, Frank! And thanks for the ingredient tips…good thing you can buy everything online these days, right? Thanks, David! And you’re right, thank goodness for online shopping! non l’ho mai fatta a casa ma la mangio volentieri al ristorante. L’ultima volta è stata qualche mese fa , uno chef napoletano molto bravo me l’ha proposta e non me la sono lasciata scappare , una delizia. La ricetta però è segreta ma guardando la tua mi sembra eccellente per cui prendo nota, voglio farla ! I have not seen this recipe before, I just love the use of wheat berries in it, it must make such a wonderful texture against the creamy ricotta. I love these recipes that are traditional for specific times of the year, I never understood it as a kid (why not make it all the time if you love it) but making it for the occasion and looking forward to the celebration meal is just wonderful. Having said that, this is a recipe that I may need to try and I wouldn’t want to wait until Easter next year! Back in the day, we used to haul cans of cooked wheat from Balducci’s in NYC to Minnesota. My recipe is pretty similar. I have stuck with farro. The wheat berries just never got soft enough. The family didn’t love the crunch in the pie! And thanks for your comment, Paola! I love desserts like this! This looks wonderful — gorgeous, and I’ll bet he flavor is awesome. Terrific recipe — thanks. Thanks, John! The flavor really is very special indeed. I’ve heard of pastiera, but not from my family (and we are just about an hour north of Naples). Isn’t it funny how language and recipes are “regional” in Italy? Or is it that Nonna never liked it and never made it? Possibly. I love that you are posting this after Easter and your reason is perfectly acceptable! At least you have a “real job” besides blogging. I, on the other hand, am blogging full time and guess what? Last year I posted my Columba di Pasqua recipe ON Easter Sunday! A little late for anyone to make it for that day/year. Life happens; I suppose it’s a good thing as I’d never want to use the word “bored” ever again. 🙂 Hope you had a good Easter, Frank! Ha ha! Nice to know I’m not alone. Happy (belated) Easter, Christina! As always, this looks fantastic, Frank! And thanks for the intel on the wheatberries. I will try to find them in my local Italian market but am glad to know they are available online. I have always wanted to taste a pastiera and now know I will have to make it for myself! PS – I completely understand you posting this after Easter! To accommodate my job, I often post things willy-nilly without ever thinking of the holidays and where they fall! I am quite impressed you are pretty much always there on time! Hope you try it, David. I know it’s a cliché but in this case it really is worth the effort. And thanks for the support on the late blogging. Nice to know I’m not alone! I cannot tell you how much I enjoy Memorie Di Angelina. It keeps my family traditions and recipes alive! My dad was born in Abruzzo, my grandmother in Campobasso. Growing up, we ate so many of these simple “peasant” dishes. It brings back wonderful memories and delicious meals. Several years ago, I did a genealogy trip to Guardiagrele and traced back 5 generations of my dad’s family. During that time, I ate many of the dishes that were made in our household. Your blog takes me back every time I read a new recipe. Thank you and never stop. Well, I found another dessert I have to make. This will be for Easter next year but I’ll have to experiment and try it out. After all, we need to be sure of the quality correct? ?A flavoring I use that is wonderfully fragrant and tastes delicious is King Arthur Flour’s Fiori di Sicilia. I’ve been using it for years in my Panetone, Pinza, and Corona. The flavor is vanilla and citrus and the scent is amazing. My bottle has lasted me quite a while. I’ve already pinned the recipe to be sure and have on hand when I want to make this. I’ll be sure to get the jarred wheatberries. Grazie, Frank. Buon weekend. Thanks, Marisa Franca! That product sounds very nice, I’ll have to try it out! one of the best dessert in the Italian repertoire. I did manage to make pastiera for Easter, but I am going to make another one (having bough some artisanal ricotta yesterday – on that: see later). I agree that perhaps “la morte della pastiera” (how do u translate that Frank?) (= the best way to have something…roughly translated) is in the morning with a little coffe.. This year I experimented with another crust, using a recipe that was very popular in Italy in the 70s, the pasta frolla by mythical food writer Lisa Biondi, a household name for many Italians (she really never existed though – she was a marketing created persona): it’s the 1-2-3 pasta frolla: 300 g 00 flour + 200 g butter + 100 g sugar + pinch salt + 1 egg to bind: really, really good (one of the best all purpose sweet pastry, I think). I also tried (on another occasion) to make a filling using rice: the grano cotto I had (from a Jar, had a distinctive lemony flavour- too much citric acid??) and I really liked it, which is odd because the one I tried yrs ago made with rice .. well, I was not convinced: I guess our palate change.. ? I don’t argue on the fact it was good or not, many options can be good and valid as the original, or almost. Thanks for all these excellent tips for making pastiera. And about Lisa Biondi: So when you say she was “mythical”, you really mean that literally. I went and Googled her and had a good chuckle. I guess she’s the Italian equivalent of the non-existent Betty Crocker here in the US. almost ricotta aka fresh curd cheese: check my post and also check the rosetta costantino’s recipe. the key is to play with temperature: the lower the better (up to a point of course), when adding better (this is also what my cheese maker teacher told me: the creamiest curds are obtained when adding rennet at 32 C degree).